This is our last People’s Choice before Thanksgiving Break, so make your votes count. Votes/rationales due by W 11/15. Make sure to name the author of the post you are choosing, as well as to link directly to the post. This entry was posted in Class Discussion, Parts IX-X, People's Choice Posts, The Handmaid's Tale on November 14, 2017 by Jill Belli. At the end of the day. They’re all prisoners. The commander seems to be one of the few commanders that somewhat feels sorry for the the handmaids that are put under his steed. He seems like the kind of person that sees the handmaids in a more human perspective than many of the other characters in this book. We were also taught that the handmaid that was ordered there before serve the commander before Offred came had the same sort of meetings that Offred is currently having with the commander. Although, the previous handmaid’s meetings with the commander were cut short the second Serena found out about their meetings. The following event of the handmaid killing herself brings a specific question in mind. What exactly are these colonies and how are the women and unwomen treated in them? I mean, i get that woman who are not useful in the Gilead empire are sent to them but we are rarely given a detail description as to what happens inside of them. But, whatever the colony truly is, we know full well that it clearly isn’t something good. Even for the woman who have given birth. The fact that the handmaid that served before Offred was so scared of being sent their that she would rather take her own life then potentially suffer. Also, how did the Gilleads officially come into power? we already know of the U.S’s downfall but we were never given an explanation as to how the Gilead kingdom came to be. Were they a small time religious cult that took the opportunity to take over the second the government collapsed? or were they were they created during the collapse by a group of like minded individuals with a lot of political influence and or money? So many things about this world are still shrouded in mystery. Which makes it all the more exciting when you’re try predict what might happen next. Our knowledge is very limited because of the fact that we’re seeing the story play out through Offred’s eyes. Also, i kind of have to ask. Is Offred morally wrong in seeing the commander’s guilt as a point of exploitation to use for her own goal of escape? This sort of question would usually (I assume) be met with a unanimous NO and, i can see why. The Gilead empire have women treated as nothing but objects to be used as a means towards an end. Offred using a weakness in the system should be seen as a work of cunning and intelligence with a side of comeuppance but, let me ask you this (and please bare in mind, that i’m going to act as a pseudo devil’s advocate. I say pseudo because i wont be fully committing to the role, just using it as a starting point for a somewhat specific argument). The commander, in his own way is actually seeing the handmaid’s as actual human beings with emotion. In this empire, woman are constantly pushed ad forced to do things with out their own opinions or feelings being accounted for. The commander seems to be the main person (as of now anyway) to actually go out of his way and endanger punishment to give his current handmaids some respite in their gray and dreary lives. The commander, just like offred, seem to be a slave to the system and can’t exactly leave or act outside of their own roles with out swift and harsh punishment from their totalitarian leaders. Sure, he may be given more power to act on than the other handmaid’s do but, he is also a prisoner in his own right. So, I’d have to ask again. Is Offred, taking advantage of the commander’s kindness and guilt morally wrong? morally right? or is the question of morals irrelevant as a whole? This entry was posted in Parts IX-X, Reading Responses, The Handmaid's Tale on November 13, 2017 by Stevens Jean. Keep calm they said on television. Everything is under control. Martin Niemoller’s quote from the early postwar period should be an eye-opener for all of us but we would prefer to ignore those lines if we possibly can. It describes the complacency with which we face oppression, hoping that it will simply go away, as petty harassment oftentimes does when it finds no reciprocation. So also it was in Gilead which became Gilead without anybody really paying attention until it was too late “It was after the catastrophe, when they shot the president and machine-gunned the Congress and the army declared a state of emergency. They blamed it on the Islamic fanatics, at the time.” (174). The fools felt uncomfortable but did not want to make matters worse so they waited patiently. “They said that new elections would be held but that it would take some time to prepare for them.” (174). It sounded reasonable to let the people decide in a democratic process and so the fools waited some more. “Newspapers were censored and some were closed down, for security reasons they said” (174) That also sounded reasonable they said, let us wait for elections; let the people decide!. “Sorry, he said. This number’s not valid.” (175) Offred was told by the store clerk when her Compucard was refused despite her having thousands in her account. ”I have to let you go, he said. It’s the law, I have to” (176) Offred was told by her employer as he laid her off, without her understanding why. It was her street-smart friend Moira who wised her up ““Women can’t hold property anymore, she said. It’s a new law. Turned on the TV today?” (178). The trap has snapped closed and Offred is now powerless. 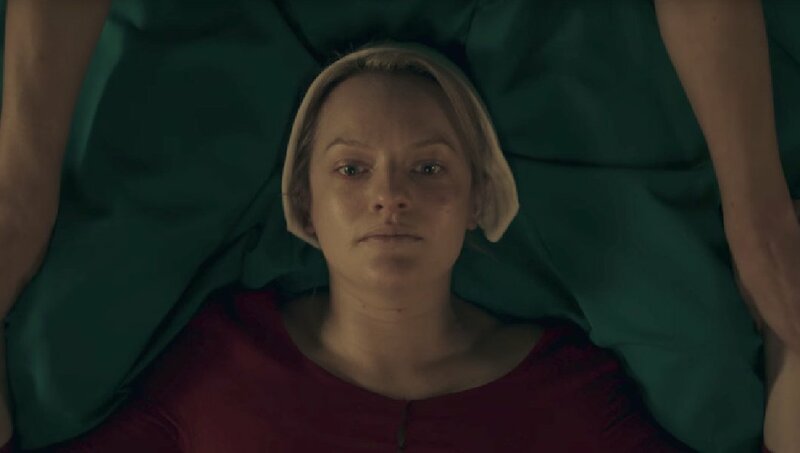 A poorly planned escape attempt and Offred becomes a Handmaid. Here she finally wakes up, determined to be reunited with her daughter. “Live in the present, make the most of it, it’s all you’ve got” (143) Offred admirable in her resolve, uses everything at her disposal to maintain her sanity. She lives only in the present, denying herself the opium of escapist fantasy or the resentment that brooding upon her loss would force upon her. Offred cannot afford resentment because it will make her vulnerable. She must and will control her emotions. Like a storekeeper she takes stock of her current situation: “I am thirty-three years old. I have brown hair….I have viable ovaries. I have one more chance.” (143) Offred thinks with cold and calculated reason. She cannot let her emotions take control of her. Her self-control is admirable and exemplary. Why express or even feel emotions that can only endanger her? As for us, the Handmaids and even the Marthas, we avoid illness. The Marthas don’t want to be forced to retire, because who knows where they go? You don’t see that many old women around anymore. As for us, any real illness, anything lingering, weakening, a loss of flesh or appetite, a fall of hair, a failure of the glands, would be terminal (154). Offreds courage and resolve in the face of such damning odds is amazing. How can she control herself? but she does! She sees the opportunity afforded her by the Commander’s interest in her. She ponders each and every move on that most dangerous of chess boards. She weight each and every word that she releases from her mouth, both with the Commander and Ofglen. She is not afraid to take calculated risks but only if they will advance her! This entry was posted in Parts IX-X, The Handmaid's Tale on November 13, 2017 by Daniel. In the Novel The Handmaids Tale, Margaret Atwood foretells a future where women who can reproduce are nothing more than a vessel to, well… reproduce. That is their only purpose. This future is under the scope of a religious yet corrupted society. The Irony. Part 9 through 10 continues with the life of it’s main character Offred. “A rat in a maze is free to go anywhere, as long as it stays inside the maze” (Atwood 165). This is how Offred feels like as she does her daily duties. This is a very disturbing thought especially with today’s norms. The handmaids are actual people with actual desires but some if not all of these desires are indeed forbidden. Much like when The Commander dangles a magazine filled with models in front of Offred. Magazines like those are forbidden in their society. “There was something Renaissance about the pose, but it was princes I thought of, not coiffed and ringleted maidens. Those candid eyes, shadowed with makeup, yes, but like the eyes of cats, fixed for the pounce”, (Atwood, 157). These are the desires of Offred. The kind of freedom to feel powerful. In her current situation she is not powerful at all. The Commanders wife hates her because she does what the wife cannot do, bear children though Offred has yet to succeed in it herself. I would imagine that Serena, the Commanders wife, does not appreciate that the Commander has to lay with Offred in order to bear children. It could be jealousy. The simple act of someone coming into your territory, unwelcomed, yet she understands the importance of it. This is why during the ceremonies where the Commander lays with Offred and Serena there as well, Serena would inflict pain and discomfort to make sure Offred knows her place. Offred can not fight back because she knows it would mean death. This slowly changes as the Commander confesses that he and Serena have not been the same. He is clearly losing his love for Serena especially with the fact that he keeps calling Offred to these late night meetings which she herself has grown comfort to. These Meetings has gotten her and the Commander closer yet she hates it because of the circumstances between them yet she is loving it at the same time because she hates Serena as well. “I now had power over her, of a kind, although she didn’t know it. And I enjoyed that. Why pretend? I enjoyed it a lot”, (Atwood, 162). Offred is hungry, not the hungry for food but lustful for power. Power is freedom and she craves it ever so much. I am sure anyone would crave power when they are pitted into a future with a low ceiling. It is either you serve your purpose or you are deemed worthless and sent out out he colonies which to many equals death. Forbidden Desires is how I see it, all of Offred’s desires are forbidden, yet she is not wrong at all for wanting more. This entry was posted in Parts IX-X, Reading Responses, The Handmaid's Tale on November 13, 2017 by Crsoto. After sections nine and ten are read, we get a better picture of the world before Gilead rose and how this structure came into place. We get a picture of Offred’s life before the chaos begins, it is just like our world. Then the attack happened, the president is murdered, congress is killed, and the constitution is taking away. Offred’s privilege’s and actions are limited if not halted, meaning that all females in the society of USA are now banned from owning anything and are dependent on next of kin(male) or husband to take care of any affairs. The first example of this is when Offred is at the local store getting her pack of cigarettes, “It’s not valid, he repeated obstinately. See that red light? Means it’s not valid.” (176). Offred takes the entire day calling the company trying to resolve this issue of why her card isn’t working and soon her boss calls her in along with about nine other females. “We’re being fired? I said. I stood up. But why?”(176), this shows how the society is moving backwards in the novel and is moving back in the direction where all the females had to rely on their husbands or fathers in order to move in life. Yet, when we look at the time that Offred is spending with the Commander, we can see the old society, before the president, congress and the constitution were killed, comeback in the little moments that they play scramble together. The commander talks with Offred, spends time with her like a human being, and an individual. As time progresses, she begins to enjoy these sessions with the commander but she tells herself something important, “I couldn’t quite define it– for the Commander wasn’t in love with me, I refuse to believe he felt anything for me as extreme as that– what would be left for her?”(161), these are her thoughts as the Ceremony takes place again and this time she is self-conscious about her body and the fact that she her hatred towards Serena Joy has turned into jealousy and guilt for taking about her husband from her, because now she is her own person in this ceremony. The Commander knows it as well, which is why when he reached out his hand towards Offred, she moved her head away, in order not to give away their relationship outside the Ceremony for fear of what might happen to her. Offred and the Commander continue their meetings and she reads in front of him, they continue to play scramble and she even asks him about the writing in the cupboard in her room. The writing in Latin, “Nolite te bastardes carborundorum“(185) which means “don’t let the bastards grind you down” comes from a book of jokes, however, a handmaid had commited suicide. The handmaid that died also came to these sessions and now the Commander is trying to save Offred from the same fate, even though he is ignorant to the way the handmaid’s are treated, he is trying to find a way to prevent the same tragedy from happening again. All Offred wants is to know what’s going on(188). This entry was posted in Parts IX-X on November 13, 2017 by Heder Pastuizaca.